Learning how to make green smoothies is not rocket science. There are tons of recipes out there. The only rule, generally speaking, is that you want to make sure you are combining the right combinations of foods in your smoothie, i.e. not mixing acidic foods with alkaline foods. After my exhaustive journey in pursuit of the best morning wake up smoothie on earth, I settled for this recipe – my own! 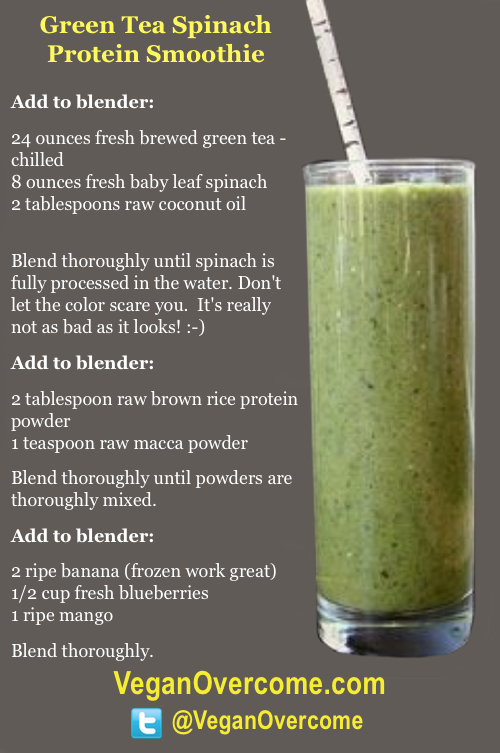 Here is one of my favorite morning smoothie recipes. Everything that goes in my smoothies is organic, so when I list something, always assume it is organic. Blend thoroughly until powders are thoroughly mixed. You can use ice if you want after blending your smoothie, although room temperature is best for digestion. I use frozen bananas or whatever kind of fruit that I happen to have frozen – typically blueberries, mango, strawberries, or bananas – to cool mine. Blend thoroughly and pour into tall glass… don’t dribble … especially if you wear white t-shirts like me. It is important that when you eat spinach that you have some sort of ‘fat’ with it, i.e. olive oil, coconut oil, etc. The fat allows the nutrients and minerals in the spinach to assimilate, i.e. the calcium primarily. This is why I use coconut oil in mine. You could use olive oil and it works just as well as a healthy fat source. This is a really well written article. Thanks for the post. You always provide such great information on health and diet. It’s awesome to find so much great information on getting healthy here. Your story is an inspiration. Thanks for being a voice, and thanks for the link for the juicers! Thanks for such great recipes. This is becoming a favorite of mine. Although my time limitations don’t allow me to juice or make smoothies the way I would like every morning, I am beginning to feel that ‘hooked’ feeling where I don’t feel my day is complete without having my morning smoothie or juice. By the way, the Breville juicer was a great choice. Not saying the others you advertise are not good choices, but the Breville really was what i was looking for. I am enjoying it immensely. Looks great! Just curious: Would the ground hemp seed not count as fat?